WITH the growing popularity of complementary medicine and health supplements, the future looks bright for herbal preparations, health and personal care products manufacturer Herbal Science Sdn Bhd. The company, which started operations in 1994, has had to expand its production capacity from a shoplot with one production line to its current premises in Taman Medan, Petaling Jaya, which houses eight lines and a laboratory. Director Tan Pye Sen said the key to becoming a successful manufacturing company was to continually research and develop new products to create new markets. “That has always been our strategy. We feel that there is huge potential for complementary medicine and health supplements in Malaysia and around the world,” he said, adding that the company planned to expand its network of clientele locally and overseas. 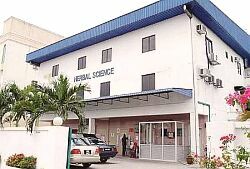 The front facade of the Herbal Science plant in Petaling Jaya. Tan said the company, which generated revenue in the region of RM10mil annually, exported about 10% of its products to countries in the Asean region. “A potentially exciting market for us is China where we are in the final stages of discussion for a significant supply contract. “China is a huge market and although the local manufacturers are able to produce at a lower cost hence the lower priced products, we plan to leverage on the fact that imports can command a premium,” he said. In line with the expected growth in demand for its products, Tan said the company would be adding another two production lines in three to four months time. Herbal Science was founded by Tan's father, Dr Tan Boon Leong, an Britain-trained pharmacist who became interested in complementary medicine in the 1980s and went to Japan and China to study acupuncture and traditional Chinese medicine. Dr Tan's inexhaustible passion and interest in developing new products in this field has been the key reason for the company's success so far. The company currently has 130 employees, of which 16 are graduates. Herbal Science also provides services such as product registration, packing services, laboratory testing including microbiology and heavy metals testing, product knowledge training, nutritional analysis and design of brochures and other promotional materials. Its current production facilities are of good manufacturing practice standards and consists of production lines that can supply products in capsule, tablet, sachet, liquid, powder and gel forms. Some of its clients include Vita Health, Cosway, Total Health Concept and Bio-Young.